A delicious and fun take on a traditional breakfast sandwich by using hash brown waffles in place of bread. Made in partnership with Dr. Praeger’s. Waffle hash browns? Yes, it’s my newest obsession. I love hash browns with my tofu scramble, so today I decided to make a breakfast sandwich using hash browns in place of bread! 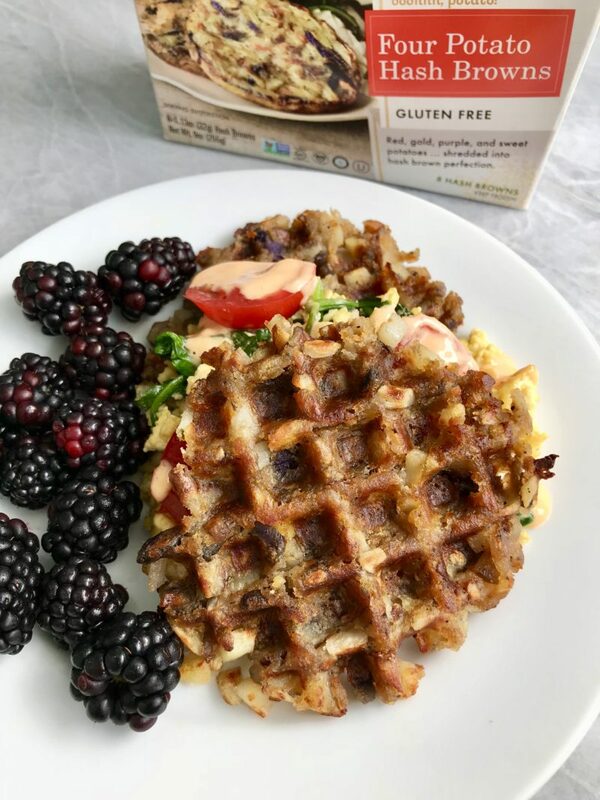 What more of a fun way to make the hash brown “bread” into waffles! I used my mini waffle maker to create these potato waffles and they came out super crispy and the perfect size for a sandwich bread. 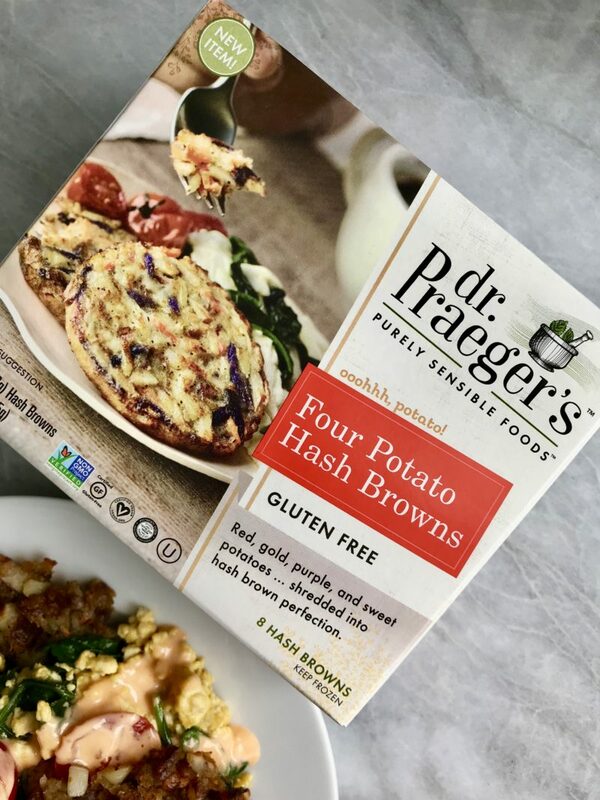 The hash browns I used were the Dr. Praeger’s Four Potato Hash Browns . These hash browns are loaded with red bliss, yukon gold, purple & sweet potatoes. I love the colors of all the potatoes in this and the balanced flavor between the sweet and other potatoes in these hash browns. If you’ve been following me for awhile now, I love Dr. Praeger’s. 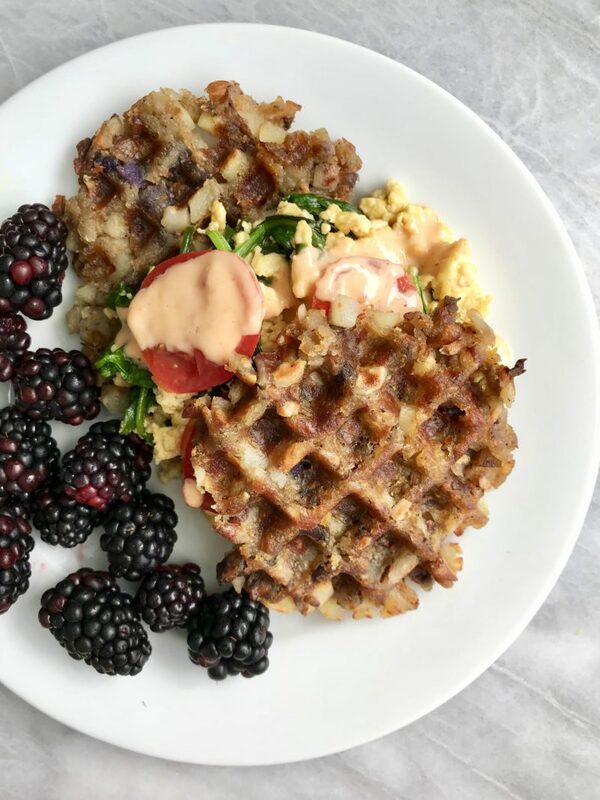 Whether it’s their veggie burgers, puffs or these hash browns, I’m obsessed. Their products are also super accessible and I always pick some up at my grocery store. The tofu scramble is mixed with some spinach and topped with tomatoes and a spicy mayo. I love a spicy sauce with just about everything and spicy mayo is my favorite and incredibly easy sauce to make. I am a breakfast food fanatic. I also feel like sometimes Vegan breakfasts can get repetitive which is why I wanted to create something different. 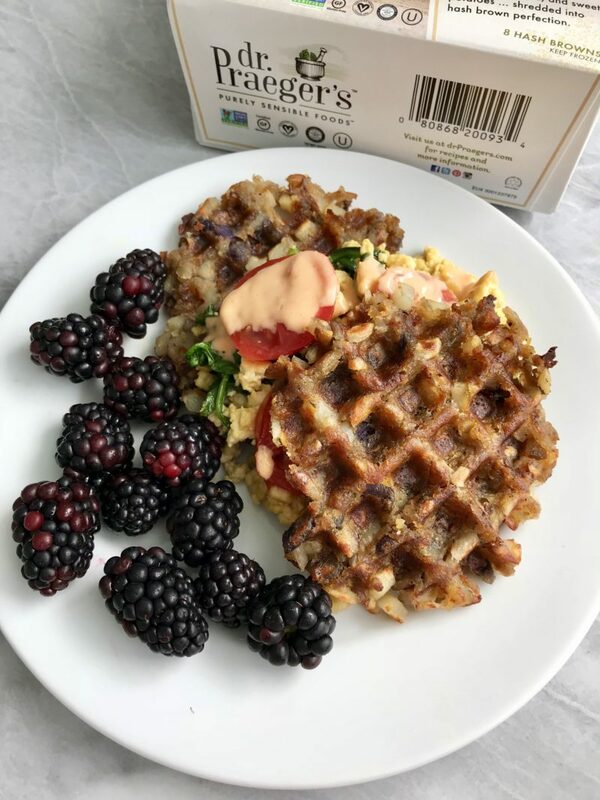 I love tofu scramble, and with it being one of my staple breakfasts, I thought it would be fun to put a creative twist on it. I get a lot of questions about fun vegan breakfasts which is why I knew I wanted to create something like this for you guys! I hope that you enjoy this recipe! If you make any of my recipes, don’t forget to tag me on Insta @plantbasedjane. Add your hash browns to a large microwave safe bowl and microwave for 2 minutes on high. After 2 minutes, mash your hash browns well with a fork until combined. Heat up your mini waffle maker and add your hash browns in 1/4 batches to the waffle maker (use oil spray if non-stick). Cook for 3-4 minutes or until browned and crispy. To make your tofu scramble, crumble your tofu in a pan (don't press your tofu, trust me). Add in all your spices and spinach. Cook for 5-6 minutes. Set aside. Create your vegan spicy mayo. Combine your mayo and sriracha and mix to combine. Assemble your sandwiches! 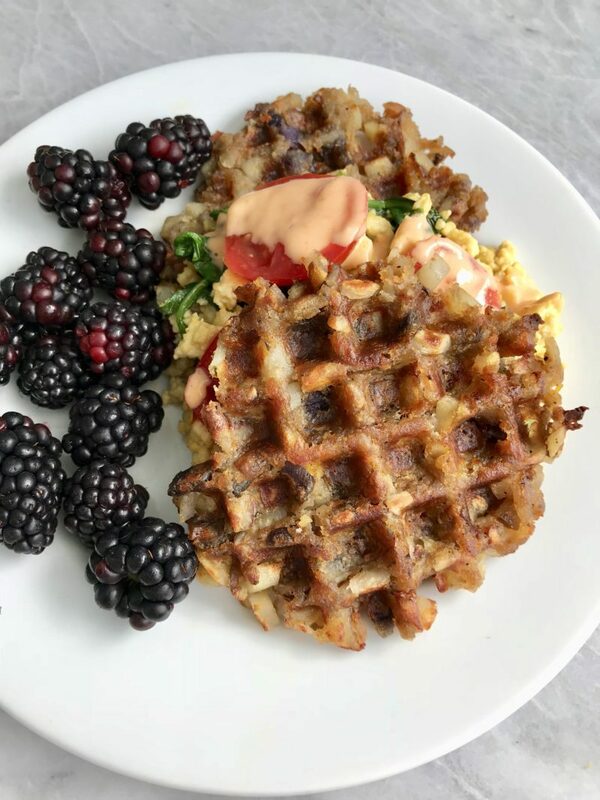 I like to add one hash brown waffle, tofu scramble, tomatoes & a drizzle of the spicy mayo. Add a waffle on top and enjoy!